For over 30 years the Darlington Family has offered refuge to Wolves who have found themselves without a place in the natural world. It has been over a hundred years since the last wild Wolf was known to exist in Pennsylvania. Originally created as a private rescue, Wolf Sanctuary of PA has grown into an educational facility. We are devoted to assuring the most comfortable and stimulating environments for our wolves. Here at Wolf Sanctuary of PA wolves and wolf dogs are given back their dignity. The Wolves of Speedwell hold a unique position as Ambassadors to the wild. It has been said that “the best wolf habitat resides in the human heart.” Perhaps it is also that the best habitat for our own wildness resides in the heart of the Wolf. INTERESTED IN VISITING WOLF SANCTUARY of PA? The only way to see the wolves is by a guided tour. *NOTE: We are now in our Fall/Winter hours. The tour on Saturday and Sunday will start promptly at 12PM. Gates will open for admission around 11:30AM and will close again at 12PM once the tour begins. Order our beautiful 2019 Calendar featuring the Wolves of Speedwell! As with all of our merchandise sales, a portion of the proceeds help support the wolves. Please allow up to 4 weeks for delivery. International shipping is not available for online purchases, please contact our office for international orders. 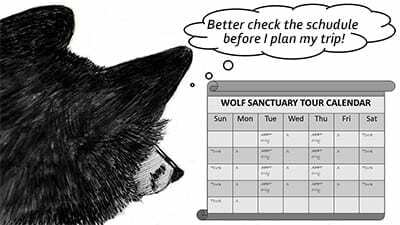 Donations are vital to the sanctuary and every donation helps us secure the health of our wolves and save the lives of those yet to come under our care. We maintain the well-being of the Wolves only through your generous support. Many of those working to secure the safety and health of our Wolves are volunteers. Contributions for Wolf Sanctuary of PA’s Adopt a Wolf symbolic adoption is $45 and helps the Sanctuary to preserve grounds and protect its animals. Adopt a Wolf for yourself or order an Adopt a Wolf as a gift. Become a member today and pledge your annual support to a worthy cause! PLANNING A STAY IN LANCASTER? Total relaxation, excellent food and a 5 star rating on Trip Advisor.